Every year, hundreds of baby mockingbirds are dropped off at wildlife rehabilitation facilities, having fallen from the nest or lost their parents. Ideally, a baby bird should be returned to the nest (it is a myth that the parents won't take back a baby bird touched by humans). Baby mockingbirds have three stages of development: hatchling (eyes closed, fuzzy), nestling (eyes open, fuzzy, feathers beginning to grow) and fledgling (feathered, exploring outside the nest). Each stage requires different care. Make a "nest" out of a sturdy bowl filled 2/3 with shredded paper. Change nesting material daily. Provide heat with a heat lamp or heat pad. Soak a cup of dry cat food in water overnight. Warm it to room temperature before serving. Use a fork or spoon to mash and mix the chow for nestlings instead of pureeing in a blender or food processor. Begin introducing live insects, such as mealworms and crickets, into the chow. For small nestlings, kill the insects first. Use tweezers to feed bits of food to the mockingbird. 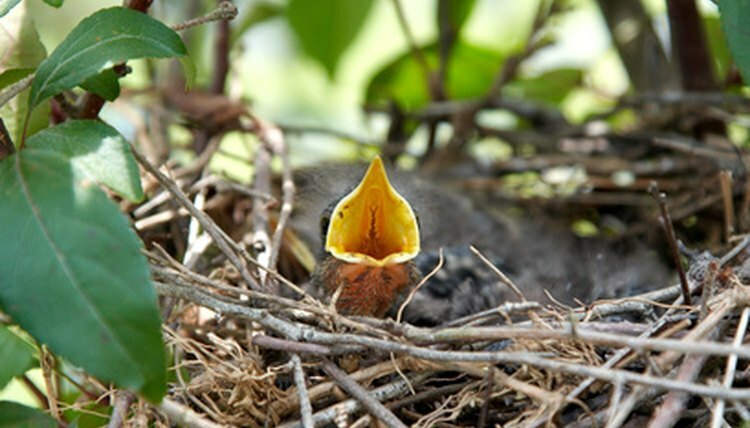 The nestling still requires feeding every 15 minutes to 1/2 hour morning to night. Introduce branches and leaves to the fledgling mockingbird's enclosure. In the fledgling stage, the mockingbird will spend less time in the nest and more time exploring and climbing. Replace grain-based baby parrot food with birdseed in the mockingbird chow. As much as possible, introduce insects, fruits, and seeds that that the mockingbird might find in the environment where it will be released. Start putting more insects and less cat food in the chow. Leave food in the enclosure with the mockingbird at all times so the bird can learn to eat on its own. If you have older mockingbirds (or similar songbirds) putting the younger bird in with older birds can help the baby learn to eat by imitation. When the fledgling mockingbird begins eating on its own, cut down on hand-feeding. Introduce a shallow water dish. Move the bird to an outdoor enclosure so it can get used to the sights, sounds and smells of nature. Perform a "soft release" once the bird is fully feathered, self-feeding and no longer gaping for food. "Soft release" means simply opening the cage door so the bird can leave when it is ready, but the bird will still have open-door access to its cage, food and water. Generally, the bird will come back for food and water for a little while. Once you have not seen the mockingbird for a few days, assume it has made the transition to life in the wild. Do not cuddle with the bird. Speak to and handle the bird as little as possible. Remember, in the wild, people pose a danger to wild birds. Generally, baby mockingbirds don't need to be given water. They will get enough moisture from their food. As per the Migratory Bird Treaty Act, it is illegal in the United States to keep a wild baby bird without a license to rehabilitate wildlife. What is a Baby Sparrow's Diet?